Colonialism/Postcolonialism is a comprehensive yet accessible guide to the historical, theoretical and political dimensions of colonial and postcolonial studies. the relationship of activist struggles and scholarship. Colonialism/Postcolonialism is the essential introduction to a vibrant and politically charged area of literary and cultural study. It is the ideal guide for students new to colonial discourse theory, postcolonial studies or postcolonial theory as well as a reference for advanced students and teachers. "Colonialism/Postcolonialism moves adroitly between the general and the particular, the conceptual and the contextual, the local and the global, and between texts and material processes. Distrustful of established and self-perpetuating assumptions, foci and canonical texts which threaten to fossilize postcolonial studies as a discipline, Loomba's magisterial study raises many crucial issues pertaining to social structure and identity; engaging with different modes of theory and social explanation in the process. There is no doubt that this book remains the best general introduction to the field." Kelwyn Sole Professor, English Department, University of Cape Town. "Lucid and incisive this is a wonderful introduction to the contentious yet vibrant field of post-colonial studies. 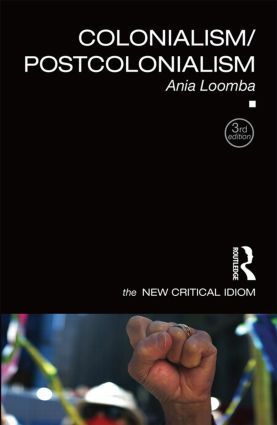 With consummate ease Loomba maps the field, unravels the many strands of the debate and provides a considered critique. She shows how post colonial theory forces us to reconsider some of our founding ideas, reorient our frames of enquiry, and rethink the very notion of colonialism. A must-read for everyone." Neeladri Bhattacharya, Jawaharlal Nehru University, India. Ania Loomba is Catherine Bryson Professor of English at the University of Pennsylvania, USA.